We recently took pig 2 to the butcher shop and we are absolutely thrilled with the difference in taste and quality of meat between pig 1 and pig 2. With pig 1, we didn’t know what we were doing…like all new farmers–trial and error are sometimes the greatest learning experiences. We built him a square pen out of hog panels and fed him all the scraps we had. We also gave him cracked corn. When we had extra milk or sour milk, the boys would soak the corn or a some hog finisher in the milk before feeding it to him. While the meat was far superior to what you find in the store, we did learn a few things to improve the meat quality. With pig 2, the guys ringed her nose (she eventually lost her rings though) and released her into the pasture. She wallowed around in the mud in the pond and ran around with the cows, sheep and goats. She ate nuts she dug up, ate grass, a bit of stolen sweet feed from the milk cow, occasionally some corn (she didn’t like much) and soured milk and also a plenteous supply of fresh scraps from our kitchen. Pig 2 was leaner. The meat off of pig 2 is much better and in the future we will be pasturing our pigs as opposed to a pen. The boys hope to set up an area for raising pigs in a wooded area on our property where there are lots of nuts to root up. 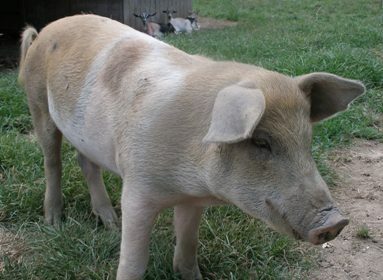 If you are thinking about raising a pig or two, from our experience, we can tell you that pigs are fun and relatively easy to raise. They grow quick and you can have delicious farm raised pork in your freezer in about 6 months. Here’s the pig piercing story…. I am one that doesn’t like sausage….but this sausage we had this time is excellent…even I like it…. I was just thinking that I need to quickly find several more pigs before our sausage supply runs out. Well now I know what those rings are for! Makes sense! Thanks so much for the information! We took our second pig in about a month ago. Our processor makes literally the best sausage in the world. The first pig was outstanding but the second is even better. We think it’s because we had an abundance of pears during his last few weeks and fed the bruised ones to the hogs. It gave a delicious sweet flavour to the sausage. Now on to pig #3 (finishing out now)! The rings in the nose keep them from rooting up the entire pasture. The will graze the grass just like a cow or goat with the ring in their nose. Without it they graze as well, but they also have a nasty habit of being a pig and digging holes all over the place. I didnt realize your could fatten a pig so quickly. This is good to know. Yet another question…what is the ring in the nose for?